Below is a complete description of all the functions of the plugin. Ad Inserter is completely free! You can install it from WordPress (Plugins / Add New / search for Ad Inserter). And if you need more than 16 code blocks, more than 3 viewports, multisite options, impression and click tracking, ad replacement when ad blocking is detected, country-level GEO targeting, scheduling or export/import of settings, you can upgrade to Ad Inserter Pro. Check also some common settings. Please make sure you have also read troubleshooting section on the bottom of this page! Each code block can be renamed. Click on the name to edit it. If you are using AdSense you may get blank (empty) ad blocks.This might be because there is some error in the code (wrong IDs), your AdSense account is not fully approved yet, your website was not accepted or your AdSense account is banned.In most cases once Google approves your account you’ll get ads. You can also try Media net ads as good AdSense alternative for contextual ads. To show a list of all blocks click on the List button in the header row. Ad Inserter can be configured to insert any code anywhere on the page. Each code with it’s settings is called a code block. Free Ad Inserter supports 16 code blocks, Ad Inserter Pro supports up to 96 code blocks (depending on the license type). 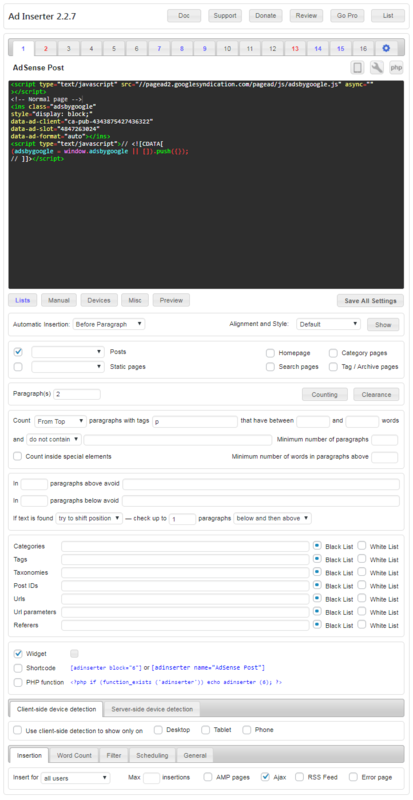 The settings page is divided into tabs – 16 code blocks and general plugin settings. Black number means inactive code block (code is not inserted anywhere), red number means block is using automatic insertion, blue number means block is using manual insertion while violet number means block is using automatic and manual insertion. Check Code Editing for detailed description of code editor, code tools, banner code generator, AdSense codes and ad rotation. To rename code block click on the block name. To insert code block (and display ad) at some position you need to enable and use at least one insertion option. Automatic insertion means that the code block will be automatically inserted on all posts or pages according to the block settings. For each code block you can also define individual exceptions to prevent insertions on some posts or pages. There are at least two different ways to exclude posts or pages – check individual exceptions for more. For single posts or pages insertion position Before Post usually means position above the post/page title, for blog pages Before Post position means position above all the posts on the blog page. For single posts or pages insertion position After Post means position below the post/page after all the content, for blog pages After Post position means position below all the posts on the blog page. Before and after Excerpt positions are available on blog pages only if your theme uses standard WordPress excerpts. Otherwise you’ll have to modify theme files and use PHP function adinserter in order to insert ads between excerpts.